Retroblog: Thank You Tabletop Users! Hello everyone, just wanted to send a quick shout out to let you know how much we appreciate you all! 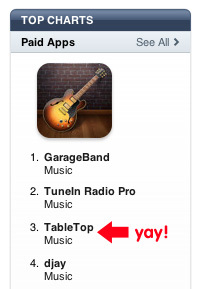 We were number 3 in the iPad Music category yesterday, and we couldn't have done it without you! We've been getting tons of feedback throughout today and yesterday - please keep it coming. We are listening to everything you have to say and taking everything under consideration as we decide where to take Tabletop as the app grows. We love feedback, so send us an email, post a comment below, or join us on Facebook. If you love Tabletop, tell a friend and/or share your praise in an App Store review. Our goal is to make this the most awesome iPad production environment that anyone and everyone can use. Thanks again, and we'll keep you posted on what we have planned for the upcoming months! Hi, already tweeted you about including a direct share to Sound Cloud. Other apps have that like Korg Electribe, but Tabletop is better! Another feature I would dearly love is the ability to edit each loop sequence after playing it. I know that quantize is there but a little visual piano roll within the sequence editor would mean less overdubbing because of one bum note. Suggest that the piano roll be zoomable much like the modules, but within the context of each module's workspace. I hope that makes sense. Fantastic app, love it.